British Touring Car Championship is a TV show on British national television from ITV4 with an average rating of 3.1 stars by TelevisionCatchUp.co.uk's visitors. We have 93 episodes of British Touring Car Championship in our archive. 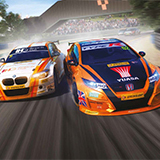 The first episode of British Touring Car Championship was broadcast in April, 2019. Did you miss an episode of British Touring Car Championship but don't you wan't that to happen in the future? Please set an alarm and add British Touring Car Championship to your favourites, so we can remind you by email when there's a new episode available to watch. For free! The opening round of the season at the Brands Hatch Indy circuit. Join Steve Rider for a look back at the British Touring Car Championship season opener. Louise Goodman takes a look back at the 2018 BTCC 60th anniversary season. Join Steve Rider for a look back at the British Touring Car Championship season finale. Steve Rider presents a highlights of Rounds 25, 26 and 27 at Silverstone. Join Steve Rider for a look back at rounds 22, 23 and 24 of the BTCC from Knockhill. Steve Rider presents highlights from Oulton Park.